We are a family owned and operated pet food manufacturer, registered with the USDA in our states. 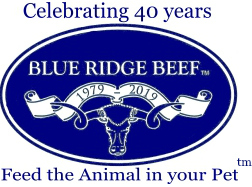 For the past 30 years, Blue Ridge Beef has been committed to providing the best nutritional quality raw food, price, and service. More people are realizing the benefits in feeding real food to their pets of all ages. Blue Ridge Beef offers special ground meats to kittens and puppies. This is where real food counts and the rewards begin. We use a common sense approach in selecting the best quality raw foods which provide the best known source of protein. appropriate natural nutrition for dogs and cats of all ages. Remember – science is not better than nature. When man changes things from their natural state to increase profits, the food is no longer ‘real’. It becomes a man-made imitation. . .